We’re excited to be back once again with friend and frequent interviewee of Eleven-ThirtyEight Jason Fry, who kindly answered our burning questions about the capital ships, starfighters, and ground vehicles of The Last Jedi! 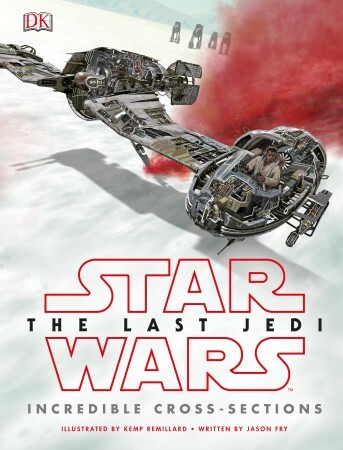 Jason’s list of Star Wars works is both popular and growing; in addition to the newest Incredible Cross-Sections, he also wrote the TLJ tie-in Bomber Command, and of course, the impending official film novelization. Jason’s a longtime fan and author who brings deep knowledge, professional writing, and great humor to his works. In this interview, we’re treated to not just info about the Cross-Sections, but also his process as a creative writer. First off, thank you for taking the time to answer our questions! This is your second Incredible Cross-Sections book and the first where you were also the author of the movie’s novelization. How was your experience writing this book different from The Force Awakens Cross-Sections? It was easier for a couple of reasons. First off, Kemp Remillard and I had already worked together and enjoyed the experience. Whether you’re talking about two writers or an artist and writer, collaboration is a weirdly intimate thing, and you go through a certain amount of sounding each other out and discovering if you’re going to get along. Kemp and I had already done that and become friends in the process, so this time around we were able to go full speed from the start. Second, The Force Awakens had let us work out the history and visual language of this new storytelling period. That hard work was already done and we could build on it, which was a lot of fun. Your well-deserved reputation as being a master of lore and connecting the dots between what we see on screen and the supporting media is fully on display in this book. As both an author and a fan, what are your favorite parts of The Last Jedi Cross-Sections? Oh, I loved a lot of things in this book. It was a lot of fun to delve into the workings of a dedicated bomber, which somehow we’d never had in Star Wars. Stories had played with that – the Y-wing was sometimes treated as a bomber and sometimes not. And you have the TIE bomber, but that’s really just a TIE variant with a different payload. The StarFortress took bombers from World War II films such as Twelve O’Clock High and brought them and the culture around them into the galaxy far, far away. That was new and awesome to play with. I liked the ski speeder because it was a lot of fun to imagine its backstory – where could something so wonky-looking have come from, and why make it into an attack craft? The answers to those questions are some of my favorite things in this book. And I really liked the spread on Canto Bight speeders. That one was a clean slate, without too much other lore that had to be brought in. I used it to imagine a American Graffiti-style culture in Canto Bight, built around car customizers. That was fun for me to explore, and I hope it makes what we see in the movie feel richer and deeper. Supporting the story is always Job One. The Last Jedi introduced a large number of new capital ships, fighters, and vehicles. A quick count shows nearly double the number from the prior Cross-Sections. Walk us through your process for taking a brand-new vehicle and fleshing it out with backstory. The first step is to give myself time to think. I like to consider the vehicle and the role it plays in the story. So at this point you’ll find me wandering around my house, muttering and walking into stuff. (Seriously, writers at work are weird, weird creatures.) Then I’ll turn to the practical aspects: How many text blocks do I have, and what’s the best way to use them? I start with the main overview text, since that has to anchor the rest. Another thing I’ve figured out is to approach that text as if it’s the only thing folks will read – it has to be able to stand alone. From there, I look at the other text blocks and try to think of a single, clearly stated idea for each of them. Those blocks are so short that if you try to cram in more than one idea you usually mess both of them up. So one text block might be technical information, another might deal with the vehicle’s role in whatever military it’s part of, a third might examine it as part of a larger design family or military tactics, etc. If a vehicle has an interesting history or backstory it’s usually worthy of its own text block, but not every one comes with that – it works for ski speeders but not, say, shuttles. I mix and match those themes and subjects and play around a bit, asking myself some questions as I go: Does this support the film’s storytelling? Am I just rehashing plot points? Does this block do what it’s supposed to? Did I cram too much into this one? Once I’m reasonably happy, I start sharpening and shortening the text, looking for chances to make tighter connections with other spreads, and hunting for ways the annotations can work with that text. Annos are great for emphasizing a point made elsewhere, or for taking that second idea that’s too much for a text block and addressing it in a different way. Do that long enough and well enough and you’ve got a book! Let’s dive into some of the entries. The book opens with the Raddus, an MC85 Star Cruiser. It has an interesting backstory and parallels in some ways the MC90 from Legends. What does this vessel say about the New Republic’s political and military outlook post-Jakku? Well, let’s look at that spread in light of the process outlined above. Main text block: This one should basically stand alone, remember. So you’ve got the Raddus’s role in the film, a nod to its backstory in terms of Admiral Raddus himself and the Mon Cals, its tactical role in the film, and a bit of a rhetorical flourish at the end to support the storytelling. There’s a little more plot stuff than I’d normally offer, but that felt right given that the Raddus is basically the Resistance’s last redoubt until Crait. The other text blocks will then go into more detail on all these points. Lower left: This one’s about Admiral Raddus and the larger story of the Mon Cals – backstory that hopefully enriches the ship’s symbolic importance. I think it avoids the “two ideas” trap because those two ideas are so intertwined, but I remember a bunch of rewriting on this one to make those work together. Bonus points (I hope) because it brings in Rogue One material in a way that doesn’t feel forced, making everything feel richer and more deeply connected. Upper left: The enhanced shields are important in the story, as they keep the Resistance fleet intact during the slow-motion chase, so they deserved their own callout. At least in my headcanon, they’re also a key part of how the Raddus does so much damage to the First Order fleet when it jumps to lightspeed. If I had a do-over on this text block I would have done more with the latter idea – that didn’t really crystallize for me until I was working on the novelization. That would have demanded some finesse – generally speaking, I think a write-up should stop short of resolutions, plot turns and the like. It’s more setup and establishment. Upper right: Backstory for the New Republic, showing you both its disarmament and how factions in the New Republic steered decommissioned ships to Leia. There’s a second idea squeezed in here about interiors and the Mon Cals working with the Corellians. It’s almost a no-no, but I thought a) the New Republic origin of the ship was a good enough framework to try it; b) neither idea was quite big enough to make a satisfying text block on its own; and c) neither of the two ideas was a great fit to be expressed through annos. So I pushed it a little. Oh, and the old name of the ship hopefully works as an acid joke about a galaxy that’s fallen back into war and chaos. Lower right: I’ll admit I’m not thrilled with this block – it’s all plot, without analysis, context or extras. It’s not a disaster, as it goes over a critical bit of plot, but if you’ve seen the movie it doesn’t give you anything else. What happened here, if I recall correctly, was I kept trying to make that block into an examination of the Resistance using skeleton crews, but it just didn’t work. That got solved by pushing the discussion of skeleton crews and automation onto the next spread, where it worked better, but left a hole here that didn’t get filled to my satisfaction. Hindsight being 20/20, this text block would have been better used to anchor Holdo with some color about previous commanders, or to examine how the command hierarchy works in the Resistance. That could have set up foreshadowing of Poe’s reaction to Holdo, or her eventual sacrifice. But I’m not going to beat myself up about it too much. You’re always going to have a few places where you wind up thinking, “I wish I’d done Y instead of X.” Like movies, books are never really finished – they escape. You also fleshed out the three other Resistance capital ships in this book. I spotted some fun “deep cut” references and enjoyed the natural evolution from older designs. Did you come up with the names of each vessel, and if so how do you approach naming them? The ship names themselves came from Story Group, but the class names were mine. With the Ninka, the Virgillians date back to Legends, and I did a lot with them in The Essential Atlas – there are a lot of battles around their region of space, suggesting that they were an independence movement that joined up with the Alliance. I liked that idea and saw a chance to run with it here in a new context. The Anodyne’s backstory was relatively straightforward, since the ship is obviously an evolution of the Nebulon-B we see in the original trilogy. The logical question to answer was what the Nebulon-C would have been built to do, and for whom. For the Vigil I leaned into its odd hybrid look, carrying that through into the story of its creation and giving us a fun anecdote about a pirate battle to boot. The class name is kind of a funny story – I called it a Tardigrade class, after a weird little animal my son fell in love with as a small child. DK kicked that name back because they didn’t want to use a real-world animal as a ship class, which I agreed with. So I came up with a gussied-up version of “vacuum bear” – Vakbeor — as a replacement, thinking I’d sub in something else later. By the time I got around to it, I’d decided I kinda liked Vakbeor and let it stand. The mighty StarFortress bombers play a key role in the film and are basically the GFFA equivalent of a WWII B-17 bomber. They are also featured prominently in your other recent work, Bomber Command. What drew you to this new vessel and how much fun did you have working on both books at the same time? I asked Kemp to do the StarFortress first because it played a prominent role in both Elizabeth Wein’s Cobalt Squadron and my book Bomber Command, with the two books essentially complementary to each other. A couple of interesting things about the bomber. The first was that it led to a great addition to the creative process for these books. Kemp and I were out in San Francisco and sat down with Lucasfilm’s creative art manager Phil Szostak (whose The Art of The Last Jedi is awesome, by the way). Phil told us that the original idea for the bombers was to have the ventral bomb bay be a separate piece, like an ammo clip in a machine gun. They decided not to film that, but Kemp and I asked if we could run with the idea in our book. Phil agreed and the three of us had a great time hashing out how “the clip” would work. Well, why stop there? Phil had a great window into the creative process of the designers and effects folks, and was generous enough to be willing to share that perspective with us. So we had the same conversation about all the ships and vehicles. I think that made our book richer and better, and I hope we get to have that conversation for future books as well. The First Order’s military might is fully displayed in The Last Jedi and this book. 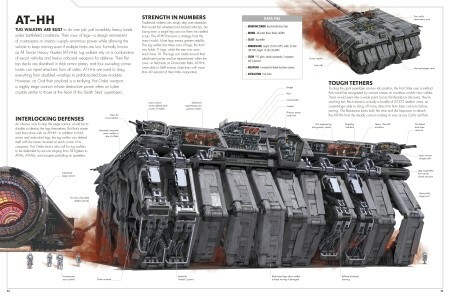 In particular, Snoke’s massive Supremacy gets a double fold out. What makes this super-sized vessel unique and what do you think it says about the First Order? That one’s right there on the spread. It’s a mobile capital for the First Order, as Snoke refuses to anoint a single world as his regime’s capital, both to remind his legions that their goal is the restoration of Palpatine’s Empire and to avoid a fate like that of Hosnian Prime. The Supremacy also carries its own supply lines with it – it’s almost a war machine/state in a box. I think that fits what we know or might suspect about the First Order, and at least in my headcanon it offers some interesting hints about what the Imperial refugees’ experiences in the Unknown Regions might have been like. Stepping out of universe, the Supremacy is just so ridiculously huge that you can have a lot of fun with it. Pretty much anything you imagine is aboard it somewhere. It’s like one of those kid’s drawings of the secret superhero/villain lair they’ll have one day after they take over the world: here’s the submarine base, the hidden volcano, the helipad, the moon-rocket facility, and so on. The star yacht Libertine gives us a chance to see how the galaxy’s wealthy (and often nefarious) power brokers travel. Tell us about some of the more unique features of this vessel and how if differs from the craft we’ve seen before. I think there are a couple of fun ideas there that speak to how wealth is expressed in the galaxy far, far away. The first is that staircase. Looking at it, I thought, “a staircase on a small space yacht seems unnecessarily dangerous.” Which led me to the idea that yeah, it is – and it’s there as a visual brag that the onboard technology supplies a ride so smooth that you don’t need to worry about such petty concerns as falling down stairs. There’s also the idea that in a galaxy where droid/automated production would be the norm, a bespoke machine crafted by organic hands is the hallmark of true wealth and taste. This book is filled with gorgeous illustrations by Kemp Remillard, who knocks each vehicle and vessel out of the park! How do you collaborate with him on each entry and who decides which parts to open for a cross-section? I leave the angles and what to show to Kemp – he has an intuitive sense of how to approach those questions in a way that will let him work best. One part of how we work together goes back to something I learned a while back while working on The Clone Wars: Incredible Vehicles for DK. Kemp has a good grasp of how engines, transmissions and the like work, and I have none – a car may as well be the product of a wizard’s spell for all I know about how it works. So Kemp does the first pass at the annos, labeling things based on what he had in mind for them. I’ll then go through and rephrase a bit here and there, apply a little Star Wars gloss, or ask Kemp if he can add a little visual bit I need for plot purposes, connections with other material, etc. Part of what makes your writing so enjoyable is that your love as a fan comes through in each work. So as we wrap up this interview, what are you most excited about for the future of this franchise and what has been your most rewarding experience so far? When I grew up as a gigantic Star Wars dork we got a Star Wars movie every three years, a monthly issue of a Marvel comic, and occasionally a slim novel would drop from the sky, with no advance warning because there was no internet. There was also the newspaper strip, but my parents only subscribed to the New York Times and it never occurred to me to ask if we could also get Newsday so I could stay up to date with those stories. I never read them until Dark Horse reprinted them in the 1990s. Now? We get a Star Wars movie each and every year. A weekly TV show. A steady stream of novels and reference books. Video games that are in continuity. Marvel has multiple titles running concurrently. There are internet video shorts. We’re getting a whole theme park that will be immersive in a way we’ve never seen before. And while everyone’s mileage may vary, I’ve really enjoyed most of this storytelling. If you could have given my eleven-year-old self a peek at what was coming he probably would have expired on the spot from sheer delight. And if you’d told that kid he’d actually get to contribute to that storytelling in some small way? He never, ever would have believed it. Heck, the 48-year-old kid he became still can’t believe it. As an author and as a fan, I pinch myself each and every day. Thank you Jason, we appreciate your time. Special thanks to Kristen Fisher at DK as well! 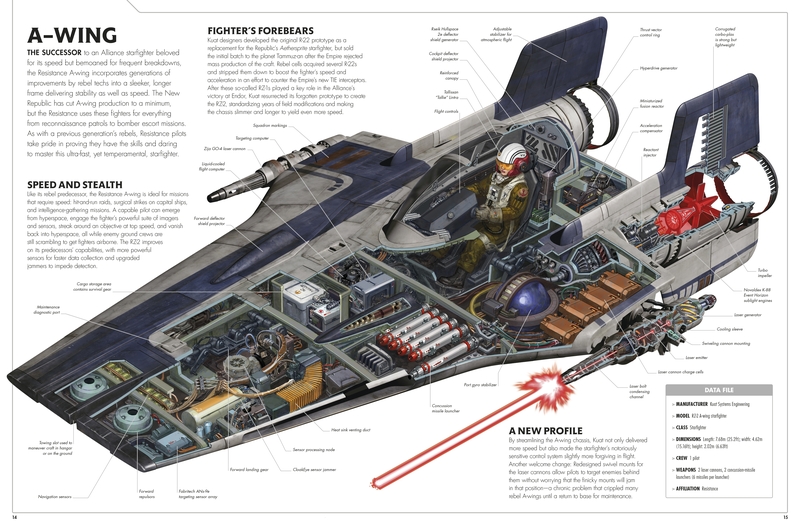 Spreads from Star Wars The Last Jedi: Incredible Cross-Sections, reprinted by permission of DK, a division of Penguin Random House LLC. Copyright © 2018 by Jason Fry; illustrated by Kemp Remillard.